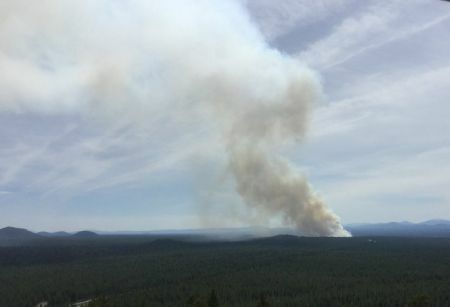 BEND, OR -- Deschutes County and the city of Bend have submitted the state’s first Community Response Plan, to request an exemption from smoke management rules during prescribed burns. "[It] Outlines how we are going to outreach to the public to let them know when and where fire’s happening, and what people can do," says County Forester Ed Keith, "Simple things like: if they’re aware that a fire is going to be planned, going to bed with their windows and doors closed, not planning for their morning run, but maybe taking it at lunchtime or in the afternoon." He tells KBND News that outreach effort is ongoing and got a big boost last year, with the launch of the CentralOregonFire.org website. Central Oregon isn't the only region in the state to use prescribed burns as a means of protecting residents from future wildfire. But, Keith says Bend's topography creates a unique situation that makes it nearly impossible to keep smoke out of populated areas, "Our challenge here is that the overnight smoke that settles into town, usually for a short period of time – we’re asking if we could be exempt for a short period of time for those air quality standards; the trade-off being that we can conduct those burns closer to town." He says the long-term air quality restrictions, as laid out by federal air pollution guidelines, would still be followed. Without the exemption, Keith says Bend would continue to violate the state "smoke intrusion" rules during critical burn operations that reduce wildfire fuels, "We’ve had several intrusions in the past, so we’re basically recognizing that we still need to do that work. The trade-off being that we still need to protect our communities from wildfire. So we need to accept a small amount of smoke in the spring, in order for firefighters to have a safe zone to protect town, should a fire be burning towards it." Keith says the state has 30 days to respond to the request. He says it could take the full timeframe since Central Oregon's Community Response Plan is the first to be submitted under the new rules.